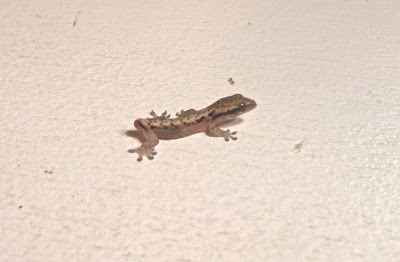 Dispatches from the Island: Man are the Geckos in the neighborhood tail-less? Man are the Geckos in the neighborhood tail-less? Awww the poor lil' fella! I do think the tails come away fairly easily as a defense mechanism. I wonder what's scaring the tails off the geckos...? hope you and Beth had a very Merry Christmas! Feliz Naivdad! hahaha. thats so unbalanced and silly looking! I am sure that answer is affirmative. The tail will be growing soon. Dude, you have to see this Gecko it's hilarous! Maybe Nunu got to it first. You can add it to her list of what she likes to chew! That is odd. Maybe you should Google it. It looks like half-gecko, half-frog. "'Ello sir, would you be interested in saving up to 15% off your..."
"Oh bugger, that's another one gone." Oh their tails come off pretty easy if they are caught in something or by something..
Boo for the poor little gecko. YEA for the upcoming season of Lost! The Tailies are on the other side of the island ! You've never seen what happens when a gecko loses its tail? It's very interesting because the tail, all by itself, wiggles like crazy, distracting the attacker from its original prey (the gecko), allowing the gecko to get away. Well, if all goes right. Here's a video of a wiggling gecko tail. Perhaps they've evolved to avoid door-slamming amputations! LMAO - we're in Aruba right now and the geckos keep losing their tails. I had no idea this was a defense mechanism. It does flop around to confuse a predator...and will grow back. Kinda weird and gross. Dude. Someone just sent this to me. You Still Think It's a Mouse? Man What Is Up With My TV Today? Some People Ask Me if Nunu was a Rescue.